There’s nothing like exploiting your favourite indulgence for a crafty afternoon and a new masterpiece to adorn your walls. After many months of collection and consumption, and many subsequent months of dust accumulation – the fall season finally gave me a chance to get a little DIY in, and create a wine cork board. Stained with your favourite merlot, or scented by a lovely chardonnay, wine corks can make for earthy décor and great gifting items, whether displayed in a clear vase on a bookshelf, or carefully adhered to a frame. 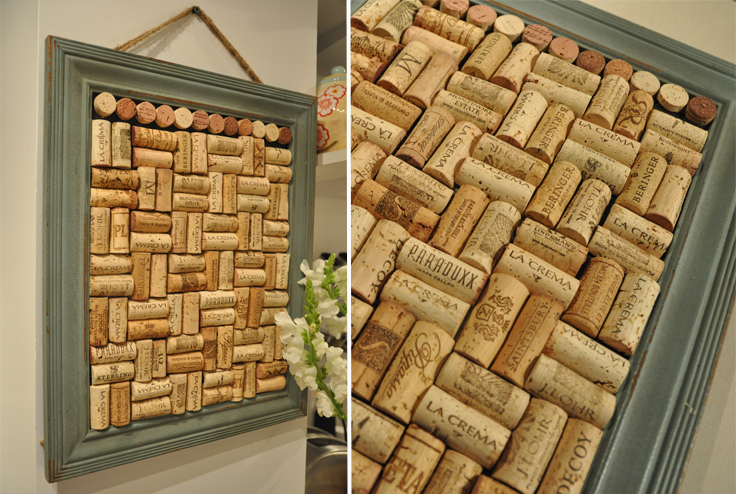 Here’s how to create your very own cork board at home with very little fuss! 1. Take your time when purchasing the frame. Make sure it suits your vision for the board, and is large enough to accommodate your corks. I purchased a 20″ x 16″ magnetic board from HomeSense, and I reversed the magnetic side of the frame so my front surface was the black backing of the board. The same can be done with a regular picture frame, just remove the glass pane. Next, you’ll need to purchase white glue from a craft store. 2. Before any gluing is done, take ample time to play with patterns. Try diagonal, vertical, horizontal and different layouts, like I’ve done below. 3. 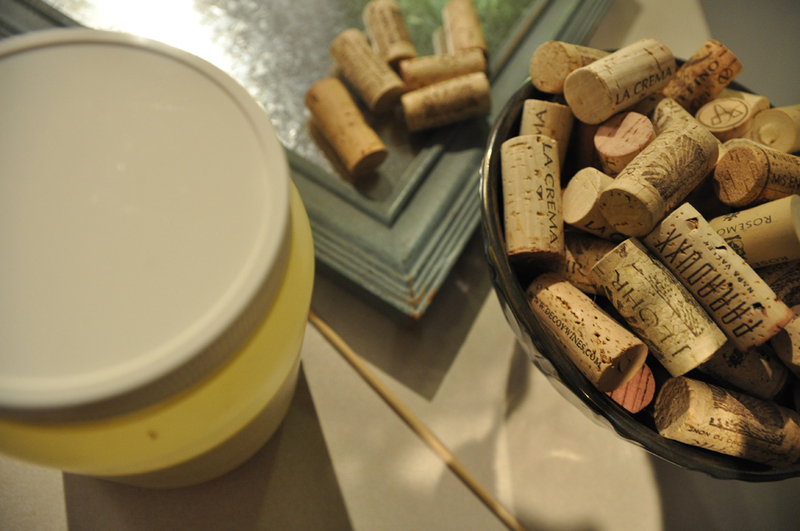 Contemplate cutting the corks in half or using the stained ends as added décor elements. I wasn’t satisfied with my pattern options using the whole corks, so I turned to cutting the corks in half with a serrated knife. 4. Once you’re satisfied with a pattern choice, you may find that the corks don’t fit perfectly as-is. Make sure they sit flat on the board, and if not, use a serrated knife to slice certain ones as needed. 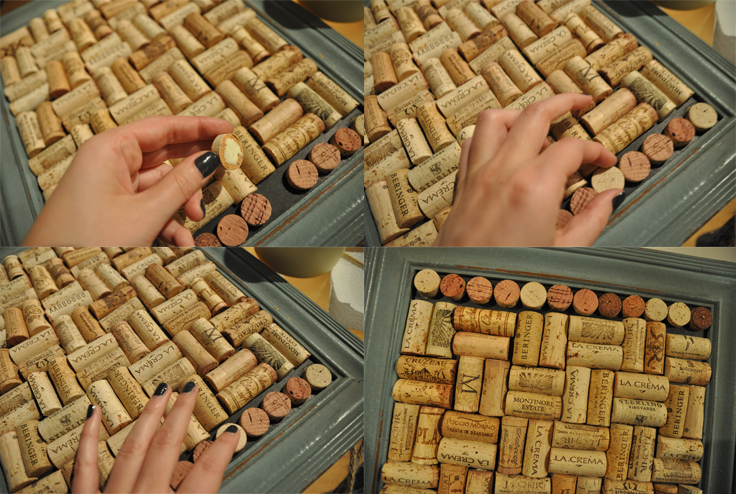 When I laid out my half corks, I was left with about an inch of free space to play with. 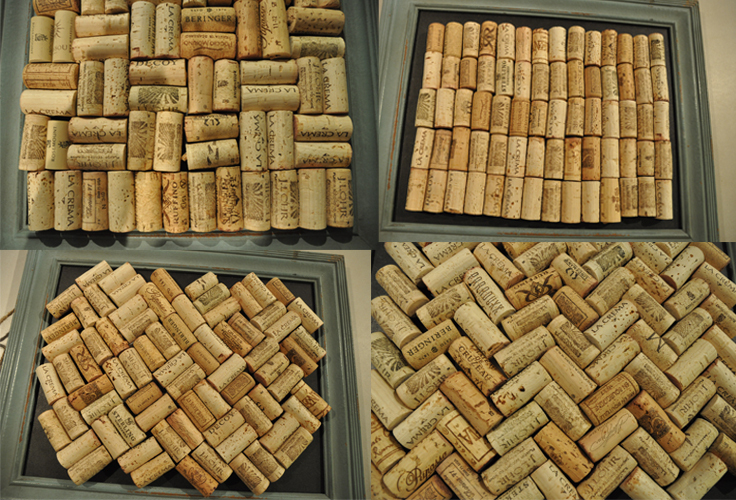 I opted for a border using the leftover whole corks, slicing off just the ends to accent the top. 5. When your corks are firmly placed, start gluing from the bottom and work your way up. Take your time and make sure there are no huge gaps. Glue each piece, place it, and press firmly to secure it. 6. Let the board sit at least overnight before hanging to ensure your corks are firmly in place. Et voila! Check out some of our other DIY projects! You talented Martha Stewart you!!! Love this ! I have no doubt made my mark on that board by contributing to drinking namely some LA CREMA and some J.Lohr. also, love the frame.